Lucas was in HEAVEN! A while ago he had seen the advert poster on the Chick-fil-A window and begged to go! I told him "sure" and then forgot. :) BUT thankfully Jamie always know's what's going on and reminded me. I don't think that there has ever been anything better for Lucas! 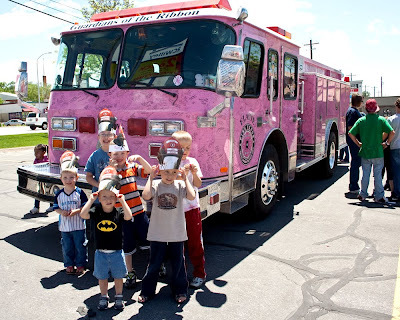 He loves the color pink and seeing all of those tough fire fighters in their pink gear was AWESOME!!!!! I called Mary and we all had a blast!!! I stole this "highlights list" from her blog.....it sums it all up! Kyle having a complete meltdown inside the fire safety house as a room filled with smoke and the smoke detector went off. Mary kept trying to tell him that it was not real and that we were ok, but he was convinced we were all going to die, and he couldn’t breathe, and we were all in danger. It was extreme fear – poor kid. He was ok once we were out, but man he was scared! And spending time with our cousins. The boys feel like they never have enough time with them. We can be with them all day, and the boys still beg to be with their cousins as soon as we are leaving. I’m glad they have such good relationships! Cousin Adventure #4 Cars 2! Cousin Adventure #2 Brigham City Museum! Matt and The Ogden Outlaws!